With two outs and two on in the top of the first inning, Dustin Demeter hit a hotshot groundball that Cam Campbell couldn’t handle at first base. The play would bring in two runs as Victoria took the lead. The Pippins answered right back in the bottom half of the inning with Kyle Dean and Jake Moberg checking in with two out RBI knocks to tie the score at two. Everything unraveled in the second inning for Pippins starter Hunter French who didn’t get much help from his defense. With one out, Hayden Jaco doubled and Tanner Haney followed with a groundball to third. Moberg’s throw was on target, but Campbell lost the ball in the sun which allowed Jaco to score from second. Six of the next seven batters reached with a double, triple and three singles adding up to six runs for the HarbourCats as they took an 8-2 lead. In the third, Victoria played add on with more help from the Pippins defense. Nick Plaia reached on an error, then stole second and third and came home on a throwing error from catcher Tyler Lasch. French would be removed after the third inning and the Pippins looked dead in the water, down 9-2 by the end of the third. 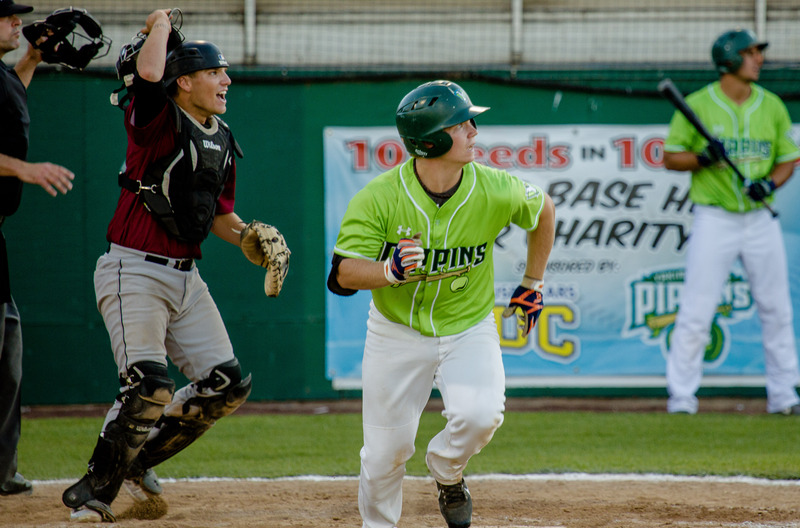 In the fourth, the Pippins began to claw their way back when Cole Jones hit his first homer of the season, a two run shot right field to bring the Pippins within five. In the fifth, the Pippins pushed across four more runs with RBI’s from Jones, Cody Jefferis and Tyler Hollow to bring the Pippins within a run. While the offense continued to chip away, Kaleb Strawn was dominant in relief of French. Picking up in the fourth inning, Strawn threw 4.1 innings of scoreless ball, striking out a season high 8 batters while allowing just two hits. Cole Pofek pulled the Pippins even with a two out, two run double to knot the score at nine. After a scoreless top of the ninth thrown by Tanner Inouye, the Pippins offense had one more big inning up their sleeve. Jones and Jefferis lead off the inning with singles and were moved over on a sacrifice bunt by Hollow. That set up Lasch who drove the first pitch he saw up the middle and past the drawn in infield for the game winning single. It was the Pippins second walkoff win of the season. The Pippins can take the series on Wednesday in game two of the series. First pitch at 6:35.